This one-pan wonder of a dish is a game changer – so much so you may need a trophy for a table decoration. 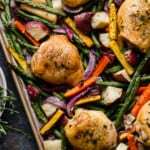 Tender, succulent chicken thighs are baked atop a bed of baby red potatoes, rainbow carrots, red onion and green beans. Add a little thyme, rosemary, salt and pepper and you have the most mouth-watering, one-pan meal in just under an hour. Only 15 minutes of that requires you to actually be in the kitchen doing something. The rest is cooking time. Beautiful! 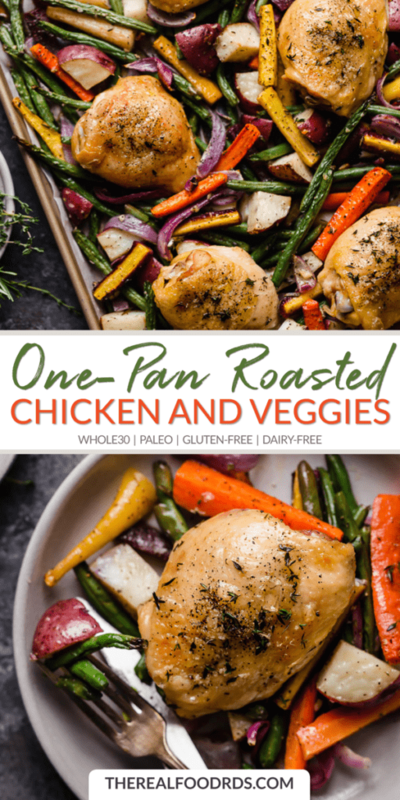 One-Pan Roasted Chicken and Vegetables is a dinner winner for both busy weeknights or slower weekends. To really speed things up, you can pre-cut the vegetables and store them in a covered container in the fridge until you’re ready to toss them on the pan with a little olive oil and herbs. Then all you need to do is add the chicken thighs, sprinkle with salt and pepper and into the pre-heated oven it goes for 35 minutes. We used bone-in, skin-on thighs here, but you can easily substitute with chicken legs or boneless, skinless chicken thighs. 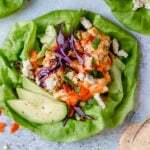 Easy to make, even easier to clean up – and leftovers rock! Because you combine and bake everything in one pan on parchment paper, clean up is a breeze. So easy even your kids can do it. Just peel off the paper and toss. Easy peasy! And let’s not underestimate the value of tasty leftovers. Heck, sometimes they taste even better! The rest of the dishes? We bet those will be licked clean… so clean up should be pretty easy there too. 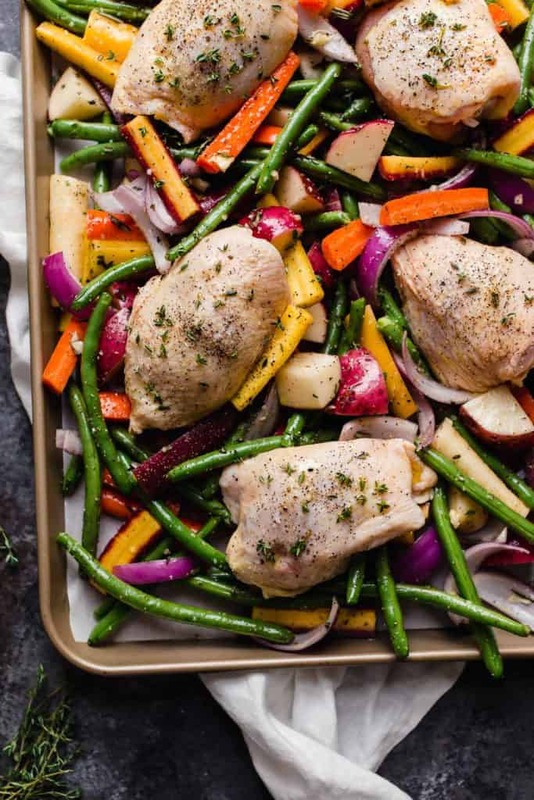 Do you love one-pan, one-dish recipes like we do? If so, we have you covered with several recipes that fit the bill. 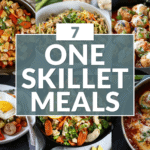 Click here for all of our one-dish recipes. 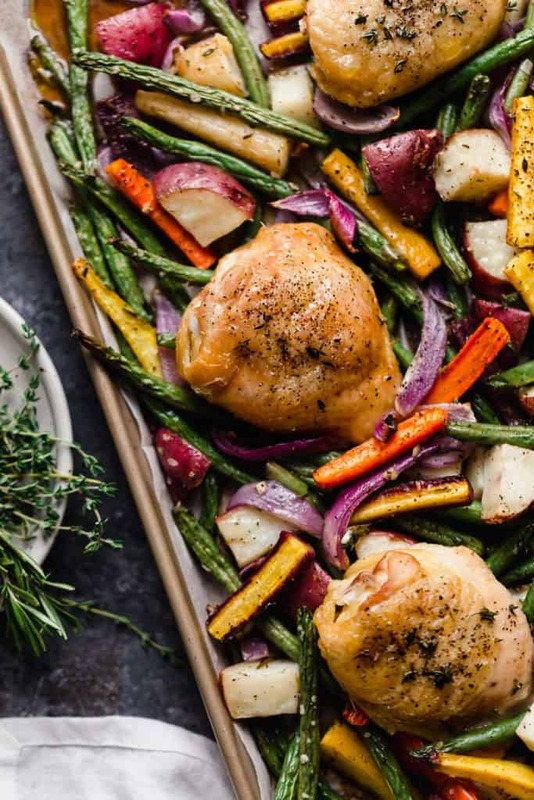 A one-pan wonder that will be on your table in less than 1 hour. And clean up is a breeze! Line a large rimmed, baking sheet with parchment paper. Toss prepped and chopped vegetables and herbs with oil right on the baking sheet. Place chicken thighs on top of the vegetables. Bake for 30-35 minutes or until chicken is cooked through and potatoes are tender. Toss and turn vegetables once or twice during cooking. What’s your favorite one-dish meal? 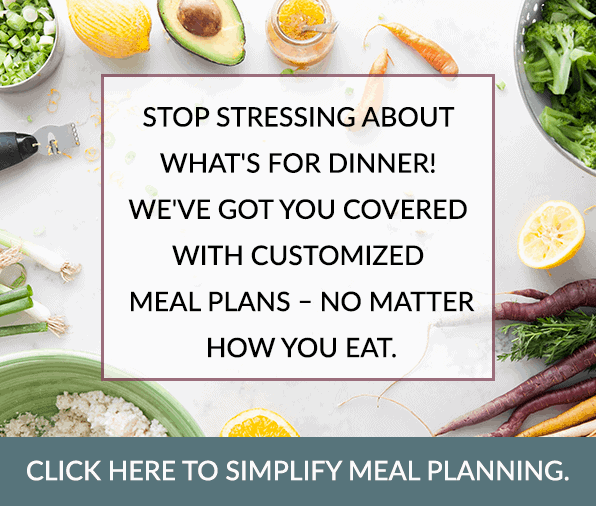 Let’s talk easy meals in the comments below – we love to hear what you’re cooking (or would like to see more of around here)! I’m loving receiving your emails and recipes! I can’t wait to try this! Thank you. Awwww!!! Thanks, Angie! 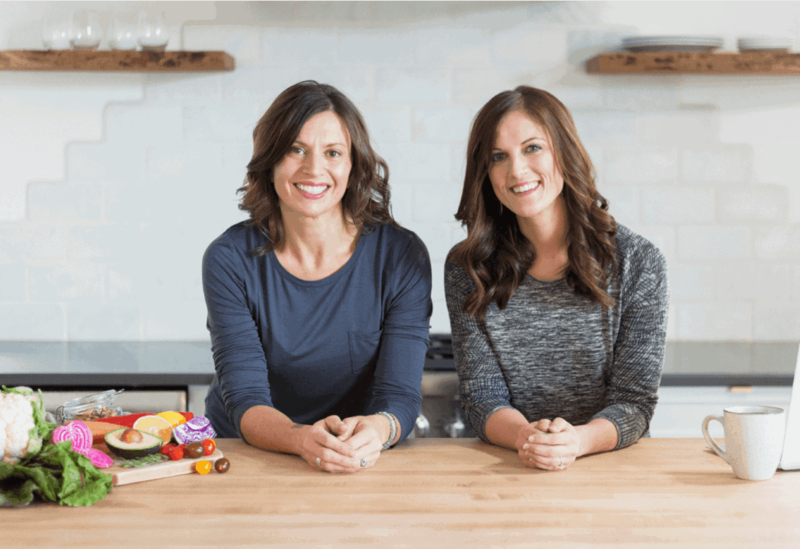 We’re so happy to hear that you love the recipes and emails. We love what we do and can’t wait to share more! I can’t wait to make this tomorrow! It looks delicious! Yeah! Be sure to let us know what you think. It’s one of our new favorites both for taste and ease. Cooked tonight, everyone enjoyed it, had to cook longer than stated but I think that was my oven. Will definitely add this one to my regular repertoire. Awesome! This dish really is so easy and delicious. Cooking time can vary from oven to oven, the thickness of your chicken thighs and how large your veggie chucks are. I even find that those things vary at my house too! Has anyone made it with the boneless skinless thighs and is so is the time the same? We’ve made it both ways and both ways it’s delicious. 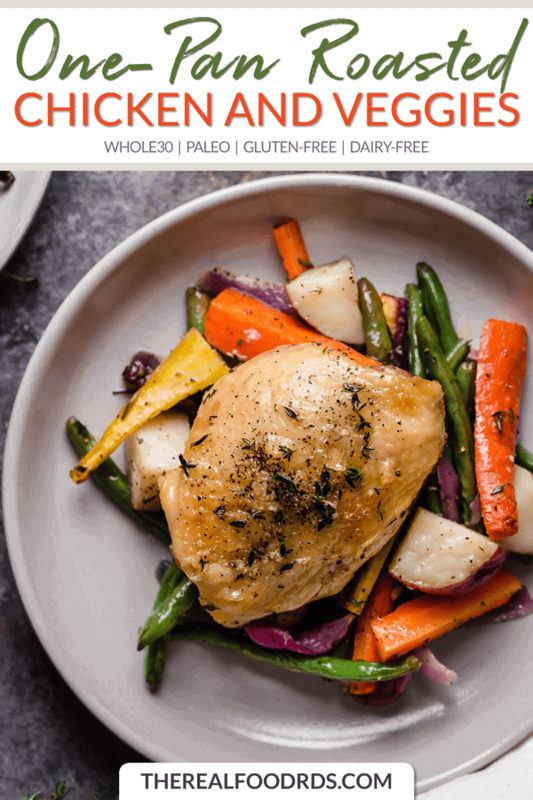 Using skin-on thighs, you’ll want to use less oil than if you use the skinless thighs (because the fat from the skin does render off when cooking and you don’t want your veggies to be too greasy). I generally don’t care for chicken and am usually underwhelmed. This is one of the best dishes I have ever had! EVER. This recipe was so easy, I was skeptical. For SIBO, I omitted potatoes and subbed scallion greens for onions and garlic oil for garlic. I also used boneless & skinless thighs. The timing was perfect & the chicken was incredibly tender and browned in all the right places. I am stunned and have to force myself to stop eating so I have leftovers. I will be making this every week. Can’t thank you enough. This is the first time I’ve ever been compelled to write a review for anything. 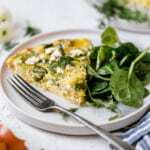 I have made this a few times, usually with extra vegetables, and it has always come out delicious! I love how easy this is to make and tweak. Yay! 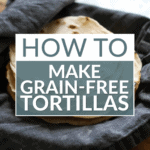 So happy to hear you found a go-to recipe that you can easily make your own. 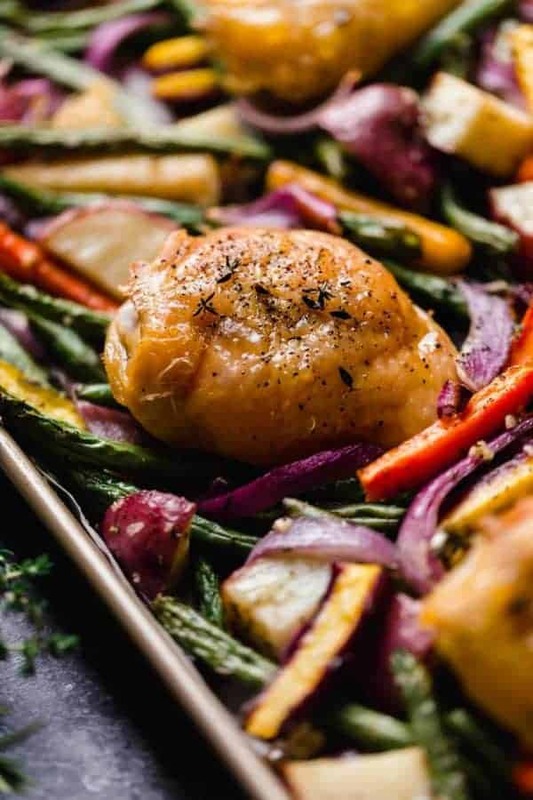 I looooooove sheet pan dinners, too! It’s a little embarrassing to say I’ve never thought of putting the veggies under the chicken before, but hey, you learn something new every day. I made this for my hubs and I last night and it was delicious! I used rainbow carrots, delicata squash, butternut squash and red onion and the combo was perfect. 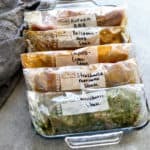 I started subscribing to a local farm fresh veggie delivery once a month and need ideas on how to cook all this fresh goodness in a few meals before they go bad, and this is now my go-to recipe for those! I’m glad I happened upon this recipe. Thanks!! I love this recipe too! You’re right, it’s the perfect way to use up veggies. That sounds like an awesome delivery service. 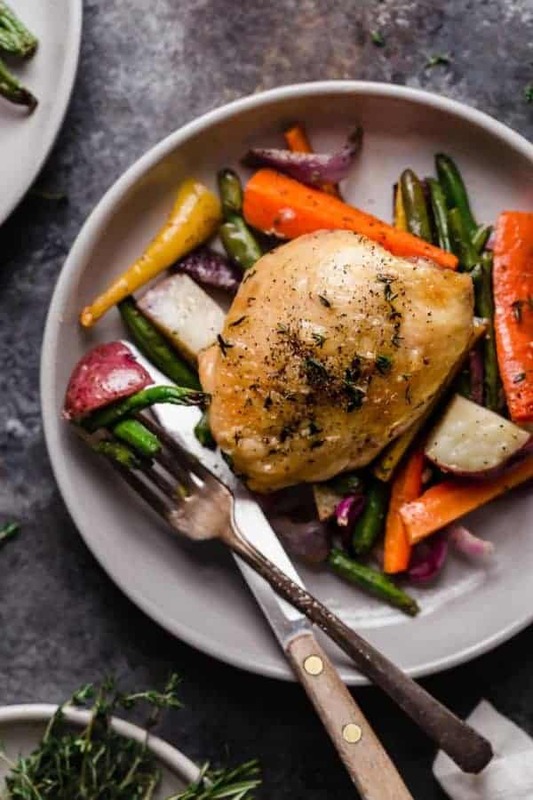 The chicken thighs with vegetables is a delicious and healthy meal. 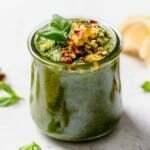 I want to see more of your recipes, and your website, or whatever this is. Please reply on how I receive your recipes. Pyrex dish would work, too! This looks delicious! 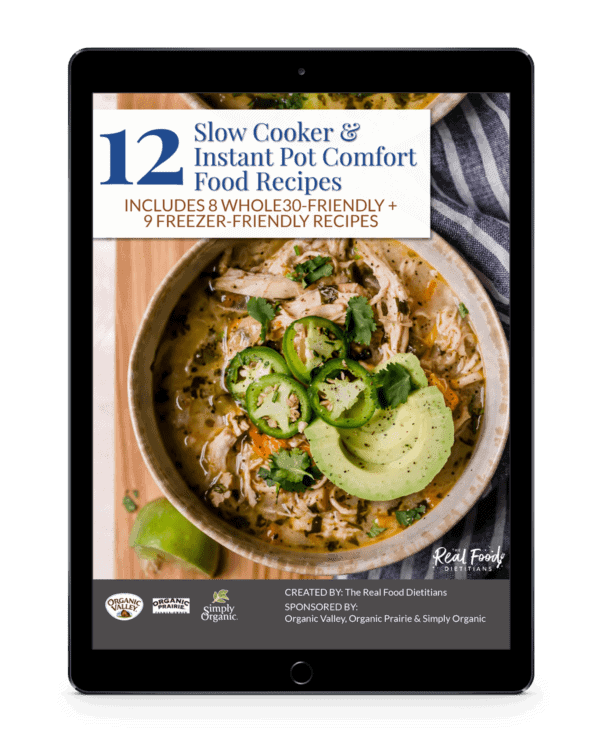 The pictures make me weant to run to the market so I can get all of the ingredients to make this recipe for dinner tonight haha thank you! This was excellent!!! I added a few dashes of a good balsamic vinegar and finished it by broiling it for a few minutes and… wow! I could eat this once a week easily. Thank you! My daughter NEVER asks for seconds and hardly eats meat…she asked me to cook more and ate 2.5 chicken thighs with carrots and green beans. Great recipe and easy! This is incredible! Thanks so much for sharing, Irene! This was delicious! And it’s simple enough where my 6 year old was able to help make it. This will definitely be in our weekly rotation. Thank you! Amazing! Way to get the little one in the kitchen at a young age – the gift of cooking skills is one of the greatest things we can give our kids.